The English version of France’s most widely-read art blog, sponsored by Le Monde, written by Marc Lenot, and translated by Miss XS, aka Stephanie Rajalingam (in 2010, translated by Helena Anrather) . Whenever I can, I visit museums and galleries in Paris and whenever traveling. 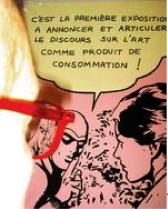 Lunettes Rouges (red glasses) is my pseudonyme. I’m an enthusiast, but not a professional, and I am not the art critic for Le Monde. Being neither an artist nor a dealer, but simply an amateur, I want to freely share my discoveries, my interests, and my on-the-spot favorites. The painting in the photograph left is by Art Keller, and the photograph was taken by my daughter, Sophie Lenot. You can reach me at lunettes dot rouges at wanadoo dot fr. Appreciates art, lives in Sydney, has an affiliation with Paris, and enjoys translating the French posts of Lunettes Rouges whilst expanding her imagination, vocabulary and knowledge of contemporary art exhibits. The photographs and videos published on this site are in principle public. If you have rights to one of the images used and object to its use, please tell me so in an email, and I will comply with your request as soon as feasible, as the French site complies with ADAGP regulations. This site is essentially not-for-profit; the very small advertising revenues cover the purchase of a few pertinent catalogues. Je représente un jeune artiste visuel et j’aimerai beaucoup vous faire part de son actualité. Pouvez-vous me dire à quelle adresse je peux vous envoyer les informations?